Go Shuck An Oyster staff will be at the Island Creek Oysters Foundation - Friends for Haiti Benefit, Saturday, September 8, 2012 at Duxbury Beach. We hope to see you there supporting a great cause and enjoying Island Creek Oysters, hors d’oeuvres, cocktails, a cigar lounge and much more! This is an event not to miss. "This all-inclusive event will take place under a spacious tent situated between the dunes of Duxbury Beach. The evening will begin with ICO’s iconic raw bars loaded with unlimited oysters as well as passed hors d’oeuvres and cocktails created by Boston’s favorite barkeep, The Hawthorne’s Jackson Cannon. Cocktails will be followed by sunset over the Back River and short plates created by some of the the best chefs in the country. Our food lines are renowned for their brevity, but queuing up with renowned chefs, winemakers, farmers, musicians and philanthropists ensures our lines are one of the night’s best forms of entertainment. Other highlights include live music, and a cigar lounge under the stars. All proceeds from Friends for Haiti directly benefit our collaboration with Dr. Valentin Abe of Caribbean Harvest to purchase Tilapia Fish Farming Kits and related supplies for Haitian families in Lake Azeui." More information will be posted on this blog as it becomes available. 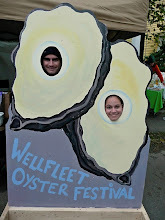 Learn more about the Island Creek Oysters Foundation and follow them on Twitter and friend them on Facebook.